Full service MOLD, FIRE & WATER emergency cleanup and restoration for disasters of all sizes. A one stop solution for your Mold, Water, Fire Damage and Remodeling. Residential and Commercial Water and Mold Removal Experts that will be there for YOU 24 hours/7 days a week. South Florida Water and Mold Restoration are trained, qualified, certified, licensed professionals that will eliminate the problem and restore your property safely and quickly. Call: 954-923-3340 or fill out the form below. Identify the extent and the cause of the issue. Our clients wanted to update their kitchen to have a brighter more functional space. Recognized with 5 Star Ratings and accredited by the Better Business Bureau. Quality you can trust. "We had a water damage and it ruined our floors and bathroom vanity. We hired Lisa and Pat, they helped us with the insurance and met the adjusters to make sure we got paid for everything. They installed new flooring and made all the repairs, came out beautiful. Would recommend them again and again, great company!" I have worked with this company many times and I can't say one bad thing about them! I help coordinate companies and owners, I highly recommend this company, everyone is always so helpful, polite, and professional. They are compassionate with the residents and about the job they do. They go above and beyond. 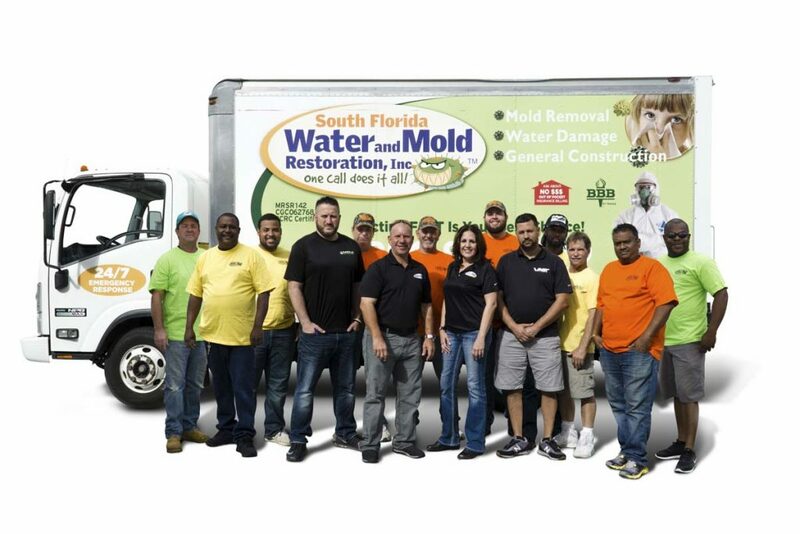 South Florida Water and Mold is hands down the BEST company to use wether it's a water damage, mold job or anything really as they are also licensed general contractors. They are clean and keep equipment organized and out of the way so we can continue our everyday routines without the stress and hassle! This number is answered 24/7 for emergencies. What are the steps in a mold remediation -where do we start? The price depends on many factors, such as how many areas, the amount of building materials to be removed, and if the air handler and ducts will need to be cleaned. A small remediation could be in the price range of $1500-$5000 depending on the various factors that are specific to your mold remediation such as air handler and duct cleaning, amongst other things. Does my insurance cover mold remediation costs? Most insurance policies have a separate coverage amount for mold remediation. However, the cause of loss must be a covered loss under the insurance policy. We will work with you and your insurance company to substantiate the claim and the work that is necessary. Many times, we will suggest air quality testing and a protocol to confirm the mold issue and to provide credibility to the claim. I smell mold how do I know where it’s coming from? When you smell mold but don’t see any mold, this is typically a humidity driven mold issue which could have developed due to a leak, the ac not being on for an extended period of time, or an issue within the ac system causing mold to cross contaminate various areas of the property. Sometimes, you will see a dusting on items such as fabrics, or shoes, and this is an indicator of settled mold spores that developed in the air and has settled onto surfaces. The only way to know the full extent of this type of mold issue, is thru air quality testing. Do you provide reconstruction services after the mold removal is done? We are a State of Florida licensed General Contractor. We specialize in residential construction and remodeling. Our showroom, by appointment, is located in Dania Beach, and we have all types of flooring products, such as waterproof laminate/vinyl, carpet and tile, as well as a Kitchen and countertop display. We can offer full reconstruction services after a mold remediation is complete for a separate price. I had a leak from my ac and now it smells musty what do I do? If your air handler is in a small closet and had leaked, many times the leak goes undetected until there is an odor or it has manifested itself with visible mold. Once mold grows near an air handler, it’s possible for the air handler to pick up the elevated mold spores and cross contaminate other areas thru the duct system. Typically, its difficult to access drywall removal and replacement behind the tight spaces of an air handler. In this situation, the air handler would have to be detached by a licensed HVAC contractor to perform the mold remediation. After the mold removal is completed, and a post remediation clearance test is successful, then drywall can be installed, and painted, and the air handler reinstalled. How long does a mold remediation take? A typical mold remediation project will take between 4-5 days with post remediation testing. Our goal is to guide our clients through the very stressful, very confusing process of having their homes and businesses restored after water damage or mold has caused property damage.